This is the first book that I have read by Laura Dowers and it will certainly not be the last. Absolutely loved it! Despite being a little lost on the first few pages due to not reading 'The Queen's Favourite' first, this didn't distract from a very enjoyable read. I rarely write a synopsis, as I never like spoiling for others. This is one book that I didn't want to come to an end! Recommended. 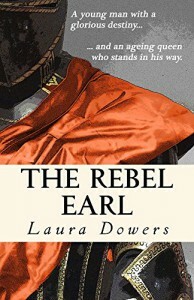 I would like to thank Laura Dowers for sending me an e-copy of 'The Rebel Earl' in exchange for an honest review.